Some commercial brewers are what I'd call "homebrewer friendly" and love to provide information about their beers. Sierra Nevada is one such brewery that has provided recipes of some of their beers to homebrewers. I love them for this because up here in the beer wasteland we call Canada, none of their products are available for purchase locally so I have to make my own. Their Torpedo Extra IPA is one of my favourites. I brewed it for the first time on September 6, 2010. The beer gets its name for the unique dry-hopping technique of recirculating the finished beer through cylindrical torpedo-like vessels filled with hops for a period of 4 days (see picture below). 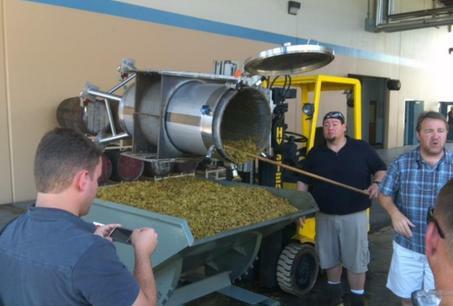 The main reasons for doing this as told by Steve Dresler (their brewmaster) is to more effectively and efficiently extract the volatile hop oils. (It saves time). Prior to this using giant hop bags resulted in poor saturation and therefore slower extraction of hop oils. Longer contact time was needed with more hops. At home, time is not as critical as in a commercial brewery where they're always looking to clear tanks for the next batch. Homebrewers can achieve the same results by simply dry hopping longer and without hop bags to provide increased contact. I typically dry hop in my primary after fermentation is almost complete and leave it for 1-2 weeks. Some intrepid homebrewers have even made their own torpedo-like devices using 5 gallon kegs, mesh filters, and a pump. 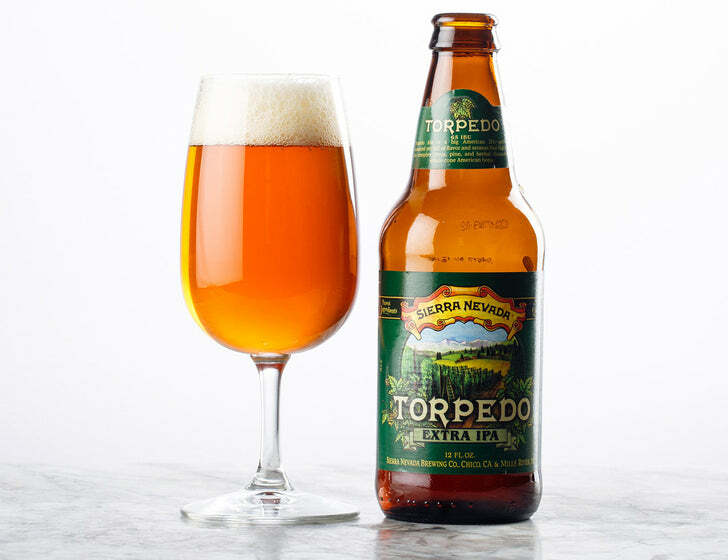 Sierra Nevada Torpedo is a big American IPA; bold, assertive, and full of flavor highlighting the complex citrus, pine, and herbal character of whole-cone American hops. This beer is all about the hops so hop substitutions are not recommended. You won't get the same beer. The combination of Magnum/Crystal/Citra as a dry hop is something I've never seen before. The use of Magnum as as late addition and dry hop is certainly different (it's typically used as a bittering hop). The grain bill is very typical of American style IPAs with a 19:1 2-row to crystal ratio. Just enough crystal malt to give it some legs to stand on against all the hop flavour. The yeast is neutral. Again, it's all about the hops! For a variation on this recipe see this American IPA recipe (batch #127). (I prefer the original here). 1.25 qt/lb mash thickness. Single infusion mash at 152F for 90 mins. Mashout to 168F. Dry hop for 5-7 days. You'll need to use 5 packs/vials or make an appropriate starter. For more information see Chapter 6 of How to Brew and Appendix A of Brewing Classic Styles. Also see the stirplate/starter equipment I use. I brewed this beer again on November 30 after almost 2 years of not making it. This was batch #149. I was forgetting what I was missing! Hop smell in the brewery is absolutely great. It's fermenting at around 66F ambient. I had a friend bring up a bottle of this last week for me to remind me how good it is. He also brought two others I can't get around here: Bell's Two hearted and a Shorts Huma Lupa Licious. As far as beer goes, I HATE living in Canada! What were the starting/ending gravities of your beer? It's hard to give suggestions as it depends on really what you mean by 'maltiness'. You could replace the 2-row with something like Maris Otter, or bump up the 60L crystal to maybe 8-10%, or increase the mash temp to 155-156F if you found that yours finished too dry (below 1.014). I've always mashed highly modified malts like crystal right in the mash from teh start, simply because it's the easist and doesn't disturb the grain bed and it they're part of my pH adjustment (they help bring the pH down). If you do make some changes by all means let us know what you tried and how it turned out. Don't get me wrong I feel like I made a great clean beer, really tastes like a west coast APA. I am still a rookie brewer, so I get a little cautious about making changes to recipes and processes. Sometimes I forget that you can change the flavor of your beer just by changing your processes slightly. It might be a while until I brew this again since citra hops are a PITA to find right now, but I will keep you posted. That finished pretty dry (1.008) so you may want to take a look at why that happened / increase your mash temp. We actually did the automation for the Oskar Blues expansion. My brother led the project and its pretty sweet! I wish I could post pictures, but that is confidential info. O well. I made that recipe... Great beer! What could I do to improve that? Mash temp? 1.023 is high. I think the beer would be too sweet tasting. If you followed the original instructions exactly, then there's likely something about your process that could use improvement. This would not be directly related to this beer or recipe. - Take a look at the original recipe. Did you change anything? Possibly by mistake? (ex: Too much crystal malt will make a beer overly sweet as it doesn't ferment out). - What was the mash temp? - How much yeast did you pitch? How old was it? What yeast was it? - How long has it been fermenting? - At what temp did you ferment? - Was the fermentation temp stable? - How did you aerate? For how long? And I changed Cystal hop with Mt. Hood! Caramunich II is a 46L crystal malt so that is certainly close enough. Doesn't affect fermentation outcome at all since you're still using 4.7% like the recipe calls for. Hops do not matter as far as final gravity is concerned. Not doing a mashout may only affect your sugar extraction efficiency so your OG may be lower. Won't affect fermentation. Speaking of which, your OG is much lower (1.058 instead of 1.069). Did you not account for your system's efficiency when you calculated how much malt to use? The numbers I provide are for a setup with 95% efficiency like mine. You need to adjust the amounts to compensate if your setup does not achieve 95%. Why 20g of US-05 yeast instead of the 36g I recommend? What size batch where you making? How old was the yeast? Did you hydrate it first? When you say "manually aerate" what exactly does that mean? The more detailed information you can provide, the better we can help. 20g of yeast into 6.6 gallons may be a bit low at the original target gravity of 1.069 if you don't hydrate, but barely. You're at 1.058 so I wouldn't worry about the amount pitched. It's likely fine. I don't know how you aerated exactly (stirred with spoon? Poured back and forth between buckets? Something else?) but maybe you didn't aerate enough? Really hard to say. I've always found it hard to aerate by hand. Could have been really old yeast too. You may have purchased the yeast at the same time but that doesn't tell us the manufacturing/expiry date. I've seen stuff 2 years past expiry on retailer shelves. It's most likely a combination of things. Maybe you didn't mash at the temp you thought you mashed at? Maybe your thermometer is broken or mash temp was not consistent if you did not have a system that recirculates, or you were measuring incorrectly. FG of 1.023 is way too high so there's something wrong somewhere or there's something you're doing incorrectly and may not realize it. This is not something you can fix by changing the mash temp. The problem is that you don't know where the issue is or what you may have done wrong so it's hard for someone else pinpoint. I think your most likely culprit is yeast health -your yeast colony didn't grow large enough because they ran out of oxygen from under-aerating. It is very common for high gravity (>1.050) brews to stop fermenting around 1.020 without proper aeration. I've had this problem plenty of times. The solution is to properly aerate your wort when pitching, preferably with oxygen and SS aeration stone AND aerating your wort again 18 hours after pitching. Some additional problems could be underpitching, improper temperature control, nutrients available for yeast (zinc, nitrogen, and simple sugars) but both of those can usually be taken care of by giving your yeast lots of oxygen during their growth phase. The higher the gravity you brew, the more important it becomes to use pure oxygen since mechanical aeration or even aquarium pumps can only do so much. For a beer that has stalled, you can attempt to get it going again by increasing temperature to high end of your yeast's range and adding 3oz corn sugar and water boiled and cooled to give your yeast some simple sugars to get going again. Simply pitching more yeast doesn't always work. Hope that helps. I may have missed it and if I did sorry. But his many gallons does this make? Ha never mind I'm blind.